1. 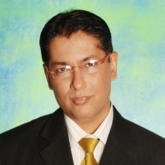 Mohan Multani (Aditya Panscholi) is a rich industrialist with high level contacts. His weakness is Roshni. 2. Nain Sukh (Raghuveer Yadav) is a blind man, a loner in life. Famous as Nain Sukh Chacha, he is the owner of a general shop. 3. Dharma (Shehzad Sheikh) is a driver of Mohan Multani and does all odd jobs for him. 4. Dr. Major Kamal Dogra (Ashutosh Rana) works in the Army Hospital and is considered to be the finest doctor. But his weakness is wine and women. 5. Inspector Pyaremohan (Deepak Qazir) is timid but opportunist. He keeps away from responsibilities, but sweet-talks people to get his work done. 6. Bishen Nanda (Akhilendra Mishra) is an ex Subedar and supplies meat, fish, eggs etc. to the army canteen. 7. Dr. Captain Ajit Verma (Milind Soman) is the most eligible bachelor with the clean record of good conduct and character. He loves Roshni and is highly possessive. The journey to unfold and solve the murder takes unexpected twists and turns. Finally, Jasraj Patel succeeds in nabbing the killer. A murder mystery, TARKIEB starts off very well; the initial reels are captivating and as the drama unfolds, the goings-on succeed in keeping the viewer's interest alive. Director Esmayeel Shroff's story telling, though simple, moves on the right track throughout the first half. Tabu's murder and the interrogation of the suspects by Nana Patekar, have been handled deftly. But things go haywire in the second half of the film. The screenplay has several loose ends and the pace drops to such a level that the viewer starts getting restless. Since the film is a murder mystery, every character is made to look suspicious, but in the bargain the writer (Moin-ud-Din) leaves several questions unanswered. One, the relationship between Ashutosh Rana and Shilpa Shetty remains a mystery throughout; their characters have not been developed properly. Ditto for Aditya Panscholi, who has been wasted in an insignificant role. Even otherwise, his characterisation does not remotely make one suspect him at all. The climax is a major letdown. After establishing the plot, the spotlight suddenly shifts on someone who has an inconsequential role. For any murder mystery to succeed, it should be able to shock the viewer with the identity of the murderer. In this case, unfortunately, the killer in this film does not shock you one bit. Even the base of the murder looks too tame. In a nutshell, the ending is an absolute letdown. The mystery created around all the suspects looks like an exercise in futility. Besides the script, the film also suffers in the editing department. The editing is loose towards the second half, thus diluting the impact of several captivating sequences. There is just one song in the entire film that one remembers even after the film has ended -- 'Dupatte Ka Pallu Kidhar Ka Kidhar Hai'. In any case, the script does not give enough scope to many songs, but at least two songs come up without any valid situation -- 'Kisika Banja' and 'Tujhe Dhoondon Main'. However, the latter is very imaginatively picturised. Mazhar Kamran's cinematography is eye-catching, but the lighting is too dark at places. Dialogues are clapworthy, specially those delivered by Nana Patekar. TARKIEB belongs to Nana Patekar, who delivers a flawless performance. The actor is not loud, nor does he play to the gallery. He gives the right expressions and delivers the wittiest of lines with perfection. Tabu is inconsistent. She emotes well in some portions, but is not in complete form at times. Shilpa Shetty has no role to talk of. A good performer like Aditya Panscholi has been wasted. Milind Soman too suffers due to a half-baked characterisation. His role has not been given a proper ending, but Milind is quite likeable despite the shortcomings. Ashutosh Rana fails to impress. Akhilendra Mishra is loud. On the whole, TARKIEB lacks in shock-value (a must for any murder mystery!) and repeat-value (for people to throng the theatres despite knowing the identity of the killer!). Even the initial-value is missing, which combined together will result in the film facing a rough time at the box-office.